Choosing the right bat and rubbers combination is a daunting task. The new technologies in malleable rubber, carbon, titanium, and wood composites bats created endless possibilities suitable for all skill levels. Below you will find information and links that hopefully will help you make the right choices. A handle that fits comfortably in your hand will allow you to free your wrist. There are several types of handles. It is said that flared is better for players with strong forehand while straight is more for players favouring their backhands however comfort is most important. The weight of the blade is another element to consider. An heavy blade will provide more power to the ball due to its mass compared to a lighter blade, however you would be able to move a lighter blade faster than an heavier one. The bat’s centre of gravity will also noticeably affect the speed of the ball. Most companies will provide the bat’s weight in grams however no information is readily available on the centre of gravity. Adult beginners should stay within the mid range while kids should play with a lighter bat. 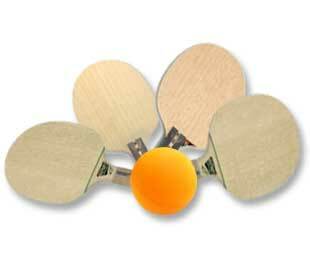 The speed of the bat is extremely important factor in the selection of the perfect combo. Each manufacturer grade the speed of their bats on a different scale, which does not facilitate this task. The bats are generally grouped in categories from defensive, all around and offensive which corresponds to their general speed. These categories are further refined with plus (+) and minus (-) qualifications then each blade is graded individually. Cost range from $15 to over $400. Most beginners will select the fastest bat thinking that it will help them hitting the ball harder. That would be a costly mistake. More advanced players usually borrow a friend’s bat for a try out or make an educated guess based on reviews and ratings. Unfortunately, there are not enough friends to try all of the blades available therefore careful research is important specially if one considers the costs involved. 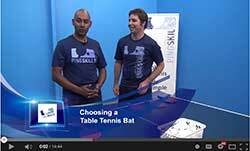 Watch this video on how to choose a bat.